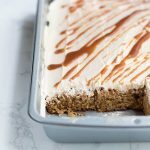 Salted Caramel Apple Cake is a perfect fall treat! No stand mixer is required for the cake, which makes it a great option for novice bakers. A few weeks ago, I was on a retreat in Columbus with some friends, and we stopped at Jeni’s Splendid Ice Cream. It was insanely good, and I’m excited to see that she’s planning to open up a shop in DC soon. While I was there, I sampled a ton of flavors. One of the standouts for me was the Salty Caramel. It was SO GOOD. 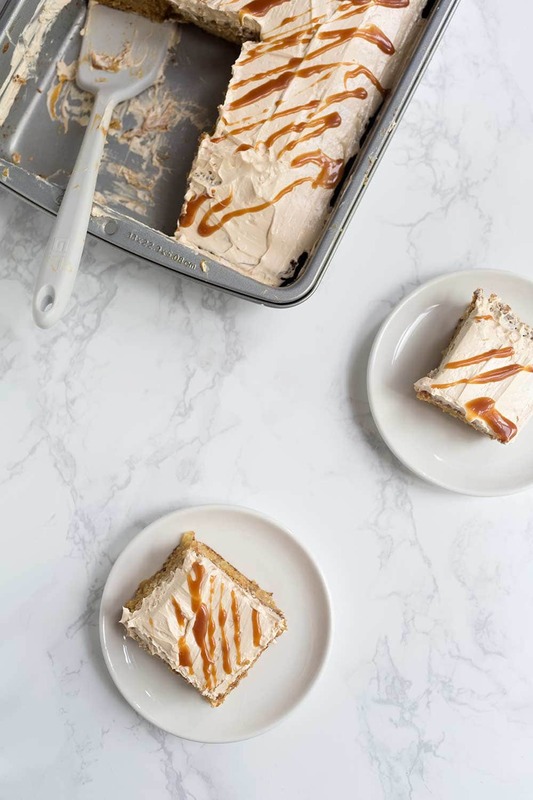 I’ve never gone nuts for caramel, salted or otherwise, but ever since having that ice cream I’ve been itching to add it to a dessert recipe. So today I bring you Salted Caramel Apple Cake. It’s tasty. The cake itself is extremely easy. No mixer is required. However, the salted caramel and buttercream recipes are a bit more advanced. 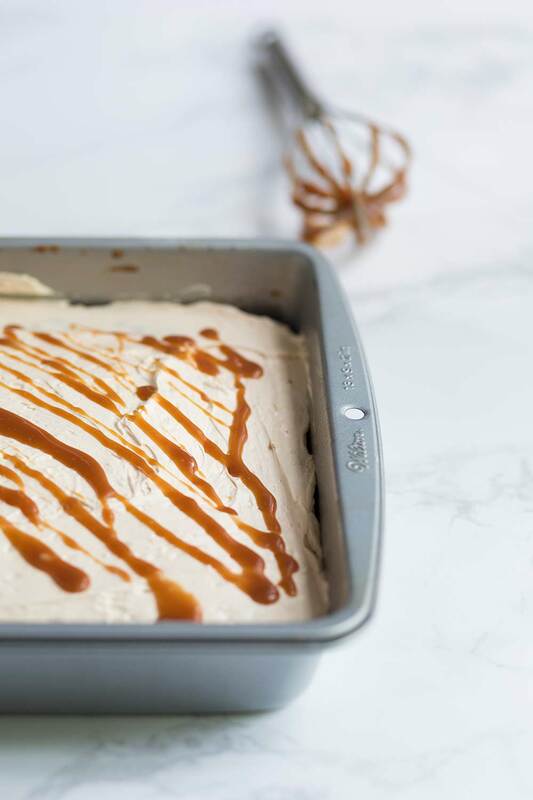 If you’re a novice baker, this recipe will work with store-bought caramel and/or a more basic American buttercream recipe. Alternately, you can omit the frosting and drizzle entirely for a simple, lovely apple cake. You can learn more about meringue buttercream in this post, which details why I prefer it to American buttercream. Keep in mind that buttercream is sweet and caramel is sweet. Go easy when adding the caramel to the buttercream, and taste as you go, otherwise you could wind up with a cloying frosting (this happened to me on my first attempt). Aim for just a hint of caramel flavor. You’ll get plenty of caramel in the drizzle. This caramel recipe will yield extra, and you don’t want to reduce the quantity since burnt sugar can be a fickle thing. Refrigerate the leftovers in a container with a tight-fitting lid for up to one month. Reheat briefly in the microwave (15-30 second increments, stirring) before using. The three components don’t have to be prepared all at once; they can be made on separate days. If preparing the buttercream in advance, store it in the refrigerator, covered, then bring it to room temperature before using. The cake can be stored at room temperature. Preheat the oven to 325 degrees F. Lightly grease a 9x13 pan with baking spray or butter. In a medium-sized bowl, whisk together the half-and-half, egg, and vanilla. In a large bowl, whisk together the flour, sugars, baking soda and salt. Fold the wet ingredient into the dry, adding the melted butter and apples toward the end. Do not overmix. Spread evenly in the prepared pan, then bake for 45 minutes, or until the top is golden brown and a toothpick comes out clean from the center. While the cake is baking, prepare the salted caramel and buttercream (these can also be made several days in advance). Add the sugar to a medium-sized saucepan set over medium-high heat. Use whisk to stir frequently as the sugar begins to clump and melt. This will take 3-5 minutes. (Note: the whisking isn’t entirely necessary, but it will help the sugar caramelize evenly). Once the sugar is completely melted, it will quickly begin turning a dark amber color. This is the critical moment, as caramel can become overly bitter very quickly. Carefully whisk in the butter. It will sizzle and bubble up, so watch your hands. Whisk until the butter is completely incorporated, approximately 20-30 seconds. Turn the heat to low and whisk in the cream in 2-3 slow pours. The mixture will bubble up again so be cautious. Whisk in the salt and remove from the heat. The caramel will thicken as it cools; if needed, you can speed up this process by placing the pot over an ice bath and stirring the caramel. Place the egg whites in a stand mixer fitted with the whisk attachment and turn on medium-low. Place the sugar and water in a medium sauce pan. Cover and set over medium-high heat. Once there’s steam, remove the cover and cook to the soft-ball stage, 235-240 degrees F, 3-5 minutes. When the sugar is almost ready, turn the speed of the mixer up to high so the eggs form a soft peak. Turn the mixer back down to medium and slowly pour the sugar syrup down the side of the bowl and into the egg whites. This will cook the eggs, making them safe to consume. Don’t go too quick or you’ll scramble them. Once the syrup is added, turn the speed up to high and continue mixing until the meringue cools to room temperature, 5-10 minutes. Turn the speed down to medium-low and slowly add the butter until it’s completely incorporated, scraping the sides of the bowl periodically. 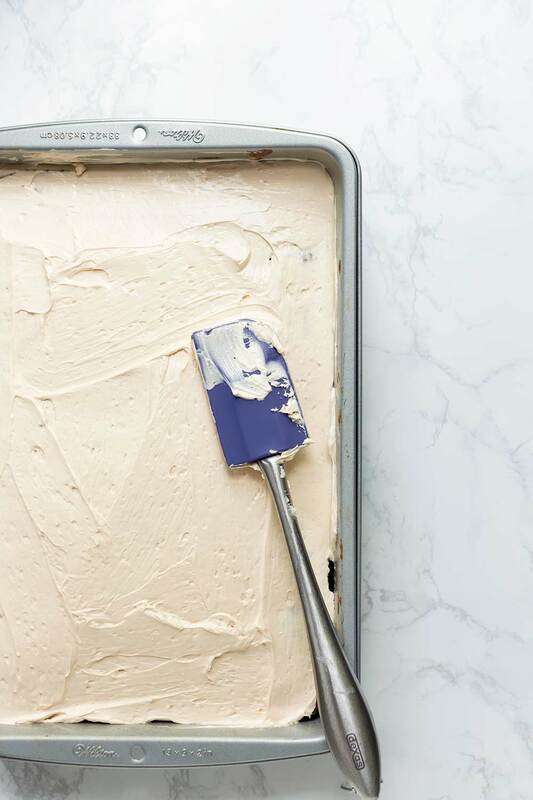 Drizzle in 2 tablespoons of salted caramel, or to taste (don’t go overboard or the frosting will be too sweet). 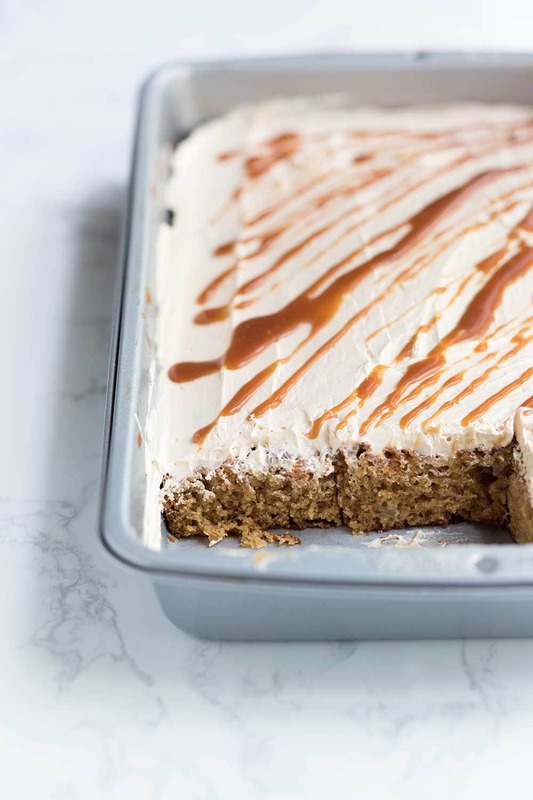 Frost the apple cake with the buttercream, then use a whisk to drizzle salted caramel on top. 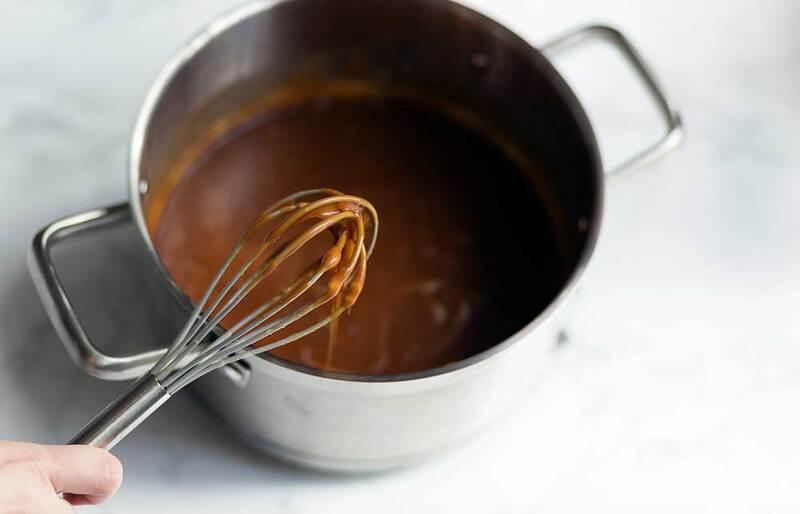 To simplify this recipe, you can substitute store-bought caramel sauce and add a pinch of salt to it (though I highly recommend learning to make it from scratch!). You can also use a standard American buttercream recipe if meringue buttercream sounds too advanced. Check out my post on meringue buttercreams, why I love them, and troubleshooting tips for more info! If you want to go super basic, you can omit the buttercream and caramel entirely for a basic apple cake. I’m such a sucker for caramel!